The fundamental features of geological study, namely, field work, collection and theory construction, were not developed until the 17th to 19th centuries. Previously, back to ancient Greek times, many scholars believed that fossils were the remains of former living things and many Christians (including Tertullian, Chrysostom and Augustine) attributed them to the Noachian Flood. But other scholars rejected these ideas and regarded fossils as either jokes of nature, the products of rocks endowed with life in some sense, the creative works of God, or perhaps even the deceptions of Satan. In the 17th and early 18th centuries the debate among naturalists intensified. One of the prominent opponents of the organic origin of fossils was Martin Lister (1638-1712), an English physician and naturalist. John Ray (1627-1705), the greatest naturalist of his time, favoured organic origin although he respected Lister’s objections. The debate ended when Robert Hooke (1635-1703), a British naturalist, confirmed from his microscopic analysis of fossil wood that fossils were the mineralized remains of former living creatures. However, he did not believe they were the result of Noah’s Flood. Prior to 1750 one of the most important geological thinkers was the Danish anatomist and geologist Nicholaus Steno (1638-1686). Born to Protestant parents, he became a Roman Catholic in 1667. Steno was the first person to give a historical reconstruction of the formation of the geological layers of an area of the earth, in this case the area of Tuscany, Italy, where he lived for some time. He did so within a biblical framework and argues that the geological evidence confirms the truth of the literal history in Genesis 1-11. In his Prodromus2 (1669), Steno expressed his belief that the earth was almost 6,000 years old3 and that organic fossils and the sedimentary strata were laid down by Noah’s Flood. Based on his field observations in Tuscany and his reading about the geology of other locations, he set forth several principles for interpreting the rock record. Those principles laid the foundation for modern geology and are still taught and used by geologists today, although most of them probably have no idea that Steno was a Bible-believing young-earth creationist. Steno’s key geological principles were these. One, most of the rock layers were once water-laid sediments. Two, marine deposits can be distinguished from fresh-water deposits by the fossils they contain. Three, the order of superposition of the layers indicates the relative age of the strata (the older deposited below the younger). Four, the sediments were originally deposited in an essentially horizontal fashion. Five, strata that are no longer horizontal were disturbed after deposition. Shortly after Steno, Thomas Burnet (1635-1715), a theologian, published his influential Sacred Theory of the Earth (1681) in which he argued from Scripture, rather than geology, for a global Flood. He made no mention of fossils and though he believed in a young Earth he took each day in Genesis 1 to be a year or longer. Following him, the physician and geologist John Woodward (1665-1722) invoked the Flood to explain stratification and fossilization, in “An Essay Toward a Natural History of the Earth” (1695). Woodward suggested that the specific gravity of the sediments and fossils determined the order in which they were buried in the rock record. In A New Theory of the Earth (1696) William Whiston (1667-1752), Newton’s successor at Cambridge in mathematics, shared similar views though not based on personal geological investigations. But he suggested that a comet triggered the onset of the Flood and he added six years to Ussher’s date of creation by arguing that each day of Genesis 1 lasted one year. Some of his reasoning was used later by those who favoured the day-age theory for Genesis 1. In Treatise on the Deluge (1768) the geologist Alexander Catcott (1725-1779) used geological arguments to defend the Genesis account of a recent creation and global Flood which produced the geological record. On the continent Johann Lehmann (1719-1767), a mining and mineralogy professor in Berlin, carefully studied German mountain strata and recognized three classes of rocks: the non-fossil-bearing and greatly inclined rocks in the high mountains (formed during creation week), fossiliferous rocks resting roughly horizontally on the flanks of the mountains (attributed to the Flood) and loosely consolidated rocks on top of these (produced after the Flood by accidents of nature from time to time). The years 1780-1820 have been called the “heroic age” of geology. During this time geology truly became established as a separate field of scientific study. More extensive geological observations began to be made, new methods were developed for systematically arranging the rock formations, and the Geological Society of London (the first society fully devoted to geology) was born. But it was also during this period that geology became embroiled in the so-called Neptunist-Vulcanist6 debate (Gillispie, 1951; Hallam, 1992). Neptunists believed that all the rock formations were deposited by water, whereas the Vulcanists contended that granites and basalts were produced by molten lava being pushed to the surface from deep in the earth. The leading advocates of the two positions were, respectively, Abraham Werner (1749-1817) of Germany and James Hutton (1726-1797) of Scotland. Werner was one of the most influential geologists of his time. He wrote very little. But as an excellent mineralogist and an inspirational and dogmatic teacher for 40 years at the University of Freiberg, Werner attracted the great loyalty of his students, many of whom became some of the prominent geologists of the 19th century (Laudan, 1987). His theory of earth history was briefly explained in his otherwise descriptive, 28-page Short Classification and Description of the Various Rocks (1786). As a result of his study of the strata in Saxony, which were clearly water-deposited, he proposed that most of the Earth’s crust had been precipitated chemically or mechanically by a slowly-receding primeval global ocean over about one million years. Building on the ideas of Lehmann, Werner divided the rock layers into five periods. The lowest three, deposited by the global ocean and constituting most of the geological record, were the primitive rocks (devoid of fossils), transition rocks (strata with some fossils and roughly equivalent to the lower Paleozoic), and the floetz formations (the fossiliferous strata from the upper Paleozoic through the Cenozoic). The upper two nearly-contemporaneous formations were the Alluvial (relatively unconsolidated deposits) and Volcanic and were the result of local depositional events. Although Werner’s theory of earth history was attractively simple, many objections were soon raised against it. But the idea of millions of years stuck with his students. Hutton’s geological views were published first in a 1788 article and then in a two-volume book in 1795, both entitled Theory of the Earth. His theory was significantly different from Werner’s. He argued that the primary geological agent was fire, not water. The sedimentary rocks were the result of detrital matter from a previous state of the world being slowly eroded off the continents and carried by rivers to the ocean floor. There the sediments were gradually transformed into rock by the Earth’s internal heat and later raised by convulsions to form the land masses that we have today, which in time would be eroded into the oceans and later raised to become new continents. Hutton’s view was an early version of uniformitarianism: everything in the rock record must and can be explained by present-day processes of erosion, sedimentation, volcanoes and earthquakes occurring at a regular rate throughout earth history.7 His cyclical view of earth history expanded the age of the Earth almost limitlessly. In fact, he asserted that he saw “no vestige of a beginning or prospect of an end” in the geological record. In his Illustrations of the Huttonian Theory of the Earth (1802) John Playfair (1748-1819), mathematician and Scottish clergyman, republished Hutton’s ideas in a more comprehensible form. He defended Hutton against the charge of atheism levelled by a number of contemporaries by arguing that Hutton’s ceaseless cycles of geological processes were like Newton’s laws of regular planetary motion. Although Playfair made no attempt to harmonize Hutton’s theory with Scripture, he did defend Hutton’s notion of the Earth’s great antiquity by asserting that the Bible only addresses the time-scale of human history, which Hutton did not deny was relatively short, as the biblical chronology indicates. Like Hutton, Playfair also argued that the Flood was tranquil, not a violent catastrophe. In the early 1800s Georges Cuvier (1768-1832), the famous French comparative anatomist and vertebrate palaeontologist, began to develop his theory of catastrophism10 presented in his Theory of the Earth (1813). It went through several English editions over the next twenty years, with an appendix (revised in each later edition) written by Robert Jameson, the leading Scottish geologist. The son of a Lutheran soldier, Cuvier sought to show a general concordance between science and religion (Coleman, 1973). In his Theory he seems to have treated post-flood biblical history fairly literally, but did not interact with the text of the scriptural accounts of Creation and the Flood at all. He reacted sharply against Lamarck’s evolutionary theory and his denial of extinctions. 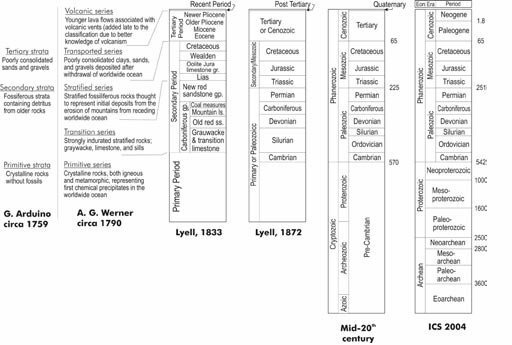 From his study of large quadruped fossils from the Paris basin, Cuvier concluded that many species had indeed gone extinct, but not all at once. Rather, like Smith, he theorized that in the past there had been many catastrophic floods. And with Smith he believed that each stratum was characterized by wholly unique fauna. The fauna had appeared for a time, were catastrophically destroyed, and then new life forms arose. Although Cuvier rejected Lamarckian evolution, it was not clear whether the new creatures were supernaturally created after each flood or if the stricken area was repopulated through migration of similar animals from outside the flood zone. He believed that Earth history was much longer than the traditional 6,000 years, but that the last flood had occurred only about 5,000 years ago. This obviously coincided with the date of Noah’s Flood, but Cuvier never explicitly equated his last flood with it.11 These violent catastrophes were vast inundations of the land by the sea. But they were not necessarily global, therefore whole species were not always eliminated. Man had first appeared sometime between the last two catastrophes. Another important development at this time was the establishment of the Geological Society of London in 1807. It was the world’s first scientific society devoted solely to geology. The thirteen founding members were wealthy, cultured gentlemen, who began with little geological knowledge but quickly learned. From its inception it was dominated by old-earth thinking (the relation of Genesis to geology was never discussed in its public communications), although it did not overtly favour either uniformitarianism or catastrophism as those views were developing. William Buckland (1784-1856), professor of geology at Oxford, was the leading geologist in England in the 1820s, initially following the catastrophism of Cuvier and Smith. Like many scientists of his day, he was an Anglican clergyman. Two of his students, Charles Lyell and Roderick Murchison, went on to become very influential uniformitarian geologists in the 1830s and beyond. In his efforts to get science, and especially geology, incorporated into the Oxford curriculum, Buckland published Vindiciae Geologicae (1820). Here he argued that geology was consistent with Genesis, confirmed natural religion by providing evidence of creation and God’s continued providence, and proved virtually beyond refutation the global, catastrophic Noachian Flood. However, the geological evidence for the Flood was, in Buckland’s view, only in the upper formations and topographical features of the continents; the Secondary formations of sedimentary rocks were antediluvian by untold thousands of years or longer. To harmonize his theory with Genesis he considered the possibility of the day-age theory, but favoured the gap theory. He never worked with the text of Genesis to show how old-earth theory could be harmonized with the Bible. Like Cuvier, he believed in multiple supernatural creations and that the creation of man was only a few thousand years ago. After further research, he published his widely-read Reliquiae Diluvianae (1823), providing what he thought was a further defence of the Flood (albeit limited in its geological effects). However, the uniformitarian criticisms of Charles Lyell and others led Buckland to abandon this interpretation of the geological evidence in the early 1830s. He publicized this change of mind in his famous two-volume Bridgewater Treatise on geology in 1836, where in only two brief comments he described the Flood as tranquil and geologically insignificant (pp. I:16, 94-95). It is clear from Buckland’s personal correspondence in the 1820s that geological evidence had a superior quality and reliability over textual evidence in reconstructing the Earth’s history (Rupke, 1983), because written records were susceptible to deception or error, whereas the rocks were truthful and could not be altered by man. He did not assert biblical fallibility, but certainly implied it in his statement. Adam Sedgwick (1785-1873) was Buckland’s counterpart at Cambridge, receiving the chair of geology in 1818. He too was an ordained Anglican clergyman and insisted all his life that old-earth theories did not contradict the Bible, but he never once attempted to show how they could be harmonized. Like Buckland, he was a catastrophist in the 1820s, but publicly recanted this view in 1831, embracing Lyell’s uniformitarianism. Through the influence of these two clerical/academic geologists and others (e.g., George Greenough, Rev. William Conybeare, Roderick Murchison and Henry De la Beche in England and many geologists in Europe), old-earth catastrophist (or diluvial) geology was widely accepted in the 1820s by most geologists, and many clergy and theologians in Britain and North America. There were several reasons most geologists at this time believed the Earth was much older than 6,000 years and the Noachian Flood was not the cause of the Secondary and Tertiary formations (Buckland, 1820; Cuvier, 1813; Phillips, 1829-36). First, it was believed that the Primitive rocks were covered by an average of at least two miles of Secondary and Tertiary strata, which showed slow deposition during successive periods of calm and catastrophe. Second, some strata had clearly formed from the violent destruction of older strata. Third, different strata contained different fossils; it was especially noted that strata containing terrestrial and fresh-water shells alternated with those containing marine shells, and that strata nearest the surface contained land animals mixed with marine creatures. Fourth, the lower strata generally showed a greater difference between fossil and living species, which suggested multiple extinctions, attributed to a series of revolutions over a long time. Fifth, evidence that faults and dislocations occurred after the induration of many strata implied a lapse of time between their formation and that of overlying strata. Finally, man was apparently only found fossilized in the most recent strata. Geologists concluded that the Earth was tens of thousands, if not millions, of years old and the relatively recent Noachian Flood affected only the rounded valleys and hills carved into consolidated strata and deposited only the superficial gravels and boulders (c.f., Buckland, 1820; Phillips, 1829). By the end of the 1820s the major divisions of the geological record were well defined (Figure 1). The Primary rocks were the lowest and supposedly oldest, and were primarily igneous or metamorphic rocks devoid of fossils. The Secondary rocks were predominantly fossiliferous sedimentary strata. The Tertiary formations also contained many fossils, but they more closely resembled existing species. Atop all were Alluvial deposits of gravel, loose sands, boulders and soil. More detailed local classifications were not always easily correlated. Chart showing development of geological timescale in England. Modified from Rudwick (1985) and Gradstein et al. (2004). A massive blow to catastrophism came between 1830 and 1833, when Charles Lyell (1797-1875), a lawyer by training as well as a former student of Buckland, published his masterful three-volume work, Principles of Geology. Reviving the ideas of Hutton, Lyell’s Principles set forth geological methods based on a radical uniformitarianism: only present-day erosional, sedimentary, volcanic and tectonic processes at present-day rates of intensity, frequency and magnitude should be used to interpret past geological activity. Although the catastrophist theory had greatly reduced the geological significance of the Noachian Deluge and expanded Earth history well beyond the traditional biblical view, Lyell’s work was a fatal blow to the Flood, explaining the whole rock record by slow gradual processes, thereby reducing the Flood to a geological non-event. His theory also expanded the length of Earth history even more than catastrophists had. Lyell saw himself as “the spiritual saviour of geology, freeing the science from the old dispensation of Moses” (Porter, 1976, p. 91). Catastrophism did not die out immediately, although by the late 1830s few old-earth catastrophists in Britain, America, or Europe believed in a geologically significant Noachian Deluge. Timelines of earth history according to the three views of the early 19th century. SB = supernatural beginning; SCW = supernatural creation week of six literal days; C = catastrophic flood of regional, continental or global proportions; F = Noah’s Flood; P = present. Uniformitarian and catastrophist old-earth theories of the early 19th century did not go uncontested (Figure 2). During the 1820s to 1840s a group of Christian writers, who collectively became known as “scriptural geologists,” published their biblical, geological and philosophical objections in pamphlets, journal articles, and short or quite long books. Some of these men were clergymen; some were not. Some were scientists and others not. And as was not uncommon at this time, some of the scriptural geologists were both clergymen and scientists. Some were geologically competent by the standards of their day (both by reading and geological field work) to critique the old-earth theories. Many of their biblical and geological objections are similar to arguments used by young-earth geologists today. The primary sources of this period show that the writings of the most geologically competent scriptural geologists were ignored and their arguments never refuted (Mortenson, 2004). 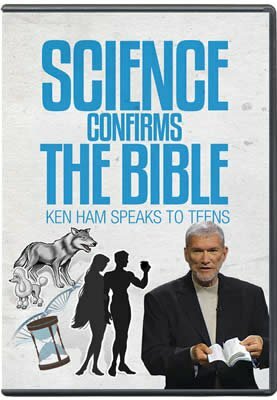 While their biblical arguments were not identical and they disagreed on minor details, the scriptural geologists all believed (in harmony with most of the church for 1,800 years) that God had created the world in six literal days about 6,000 years ago and that most of the geological record was the result of the global, year-long, catastrophic Noachian Flood. From the mid-1820s geology rapidly matured. Smith’s stratigraphic methodology (using fossils to correlate the strata) was applied more widely by a growing body of geologists to produce more detailed descriptions and maps of the geological record. There was still debate over the nature and origin of granite, and Cuvier’s widely-accepted interpretation of the Paris basin was being challenged. By the early 1830s, all the main elements of stratigraphic geology were established, and maps and journal articles became more technical as geology made the transition from amateur avocation to professional vocation. The 1830s and 1840s saw much debate about the classification of the lowest fossiliferous formations (the Cambrian to Devonian), and the glacial theory emerged to explain geological features which the earlier catastrophists had attributed to the Flood. 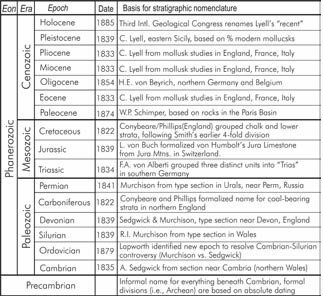 By the mid-1850s all the main strata were identified and the nomenclature was standardized (Figure 3). However, none of these developments added any fundamentally new reasons for believing in a very old Earth, and all of this fine-tuning was based on principles established by Cuvier, Smith, Lyell and others. Nomenclature for the column developed during the mid 1800s. In the last half of the 19th century, estimates of deep time increased and became more precisely quantified. In 1863 the great English physicist Lord Kelvin (1824-1907) used thermodynamics related to the internal heat of the earth to argue for a “young” age of the earth of only about 98 million years, much too short for Darwin’s theory (which he rejected). But his view did not hold sway for long. Radioactive isotopes were discovered in 1896 by the French physicist Henri Becquerel (1852-1908). Heat from their decay negated Kelvin’s conclusion, supporting the geologists’ calls for hundreds of millions of years. Between 1903 and 1906, the famous New Zealand physicist Ernest Rutherford (1871-1937) determined that isotopes could be used to date rocks. By the 1930s, through the efforts of Arthur Holmes, the age of the earth had expanded to about 2 billion years, and has since risen to ~4.6 billion years (Robb et al., 2004). Modern additions to geology (e.g., plate tectonics) are merely refinements of the uniformitarian-naturalistic worldview. In the last part of the 20th century, two unexpected ideas emerged. In 1961, the young-earth creationist movement was launched by the publication of The Genesis Flood by John Whitcomb and Henry Morris, who had been influenced by a few critics of old-earth geology in the first half of the 20th century. Since then, creationists have been hammering out an increasingly sophisticated model of origins (Morris, 1993). In the 1970s, some secular geologists also began to question uniformitarian assumptions. Returning to ideas of the early 19th century catastrophists, these “neo-catastrophists” reinterpreted many formations to be the result of rapid, violent catastrophic floods (Ager, 1973; 1993). It remains to be seen if the geological establishment will continue to ignore the work of modern YEC geologists, as they did the writings of geologically competent scriptural geologists. To understand the historical development of the old-earth theory and the extent of the validity of the conventional geological column, it is important to carefully consider several key issues. Philosophical assumptions drove the development of the old-earth theories in the early 1800s. Two key assumptions were: (1) everything in the physical universe can and indeed must be explained by time, chance and the laws of nature working on matter; and (2) natural physical processes have always acted in the same manner, rate and intensity as we see operating today. These assumptions form the basis of uniformitarian methodological naturalism, which took control of modern science in the early 19th century, decades before Darwin published Origin of Species in 1859. Although many scientists today allow large-scale catastrophes, uniformitarian thinking is still endemic and naturalism is king. So, the heart of the debates about the age of the earth and about how to correctly interpret the geological record is a massive worldview conflict. In order to judge what has happened, or even what will happen, one need only examine what is happening…. Events which occur every day, movements which succeed each other and repeat themselves without interruption, constant and constantly reiterated operations, these are our causes and our reasons (cited in Gillispie, 1970-1980, vol. 2, p. 578). Obviously, such statements ruled out a priori God’s supernatural creation of the world in six days and the supernatural, global, year-long, catastrophic Noachian Flood. Werner, Laplace, Smith, Lyell and other leading developers of old-earth thinking followed this reasoning, and sadly many Christian geologists (Britain’s Buckland and Sedgwick, America’s Benjamin Silliman and Edward Hitchcock) were infected with this kind of thinking without realizing it. This naturalistic (deistic or atheistic) way of thinking developed in the social context of an overtly Christian culture in Europe and it was the result of a conscious rejection of Scripture. This anti-biblical worldview was often deliberately hidden from view in early published works which played lip-service to God’s existence. But unpublished writings from the same men are more straightforward. Buffon correctly perceived that his old-earth theory would be unacceptable to the Catholic Church. So, although his unpublished manuscript estimates 3,000,000 years for the age of the earth, his published book gives an age of 75,000 years (which still was not acceptable to Catholic theologians). Jacques Roger, a leading 20th century French historian of science, says that “Buffon was among the first to create an autonomous science, free of any theological influence” (O’Connor and Robertson, 2004, no pagination). Of course, he did no such thing. Rather, he wanted to enslave science to his own unbiblical theology and to “free” science from the Christian framework that was the womb for modern science. In his Theory of the Earth, Cuvier briefly mentioned Genesis, the Creation, the Deluge and God, but dismissed all earlier efforts (including Burnett, Woodward and Whiston—no mention of Steno) to make sense of the geological record in light of those two events. He himself made no attempt to correlate his theory with biblical history except to allude to the post-Flood biblical chronology as giving a reasonable date for the Flood. But he did not specifically refer to any passage and ignored Genesis 1-9 and Exodus 20:8-11. I have always been strongly impressed with the weight of an observation of an excellent writer and skillful geologist who said that ‘for the sake of revelation as well as of science—of truth in every form—the physical part of Geological inquiry ought to be conducted as if the Scriptures were not in existence’ (Rudwick, 1976, p. 150). Such reasoning might be permissible, if the Bible did not describe any events relevant to the formation of the rocks of the earth (such as the Creation Week and the Flood). But since the Bible does speak of such events, Lyell’s approach is like trying to write a history of ancient Rome by studying the surviving monuments, buildings, artwork, and coins, but intentionally ignoring the writings of reliable Roman historians! I trust I shall make my sketch of the progress of geology popular. Old [Rev. John] Fleming is frightened and thinks the age will not stand my anti-Mosaical conclusions and at least that the subject will for a time become unpopular and awkward for the clergy, but I am not afraid. I shall out with the whole but in as conciliatory a manner as possible (Quoted in Brooke, 1979, p. 45, bracketed words added). I am sure you may get into Q.R. [Quarterly Review] what will free the science [of geology] from Moses, for if treated seriously, the [church] party are quite prepared for it. A bishop, Buckland ascertained (we suppose [Bishop] Sumner), gave Ure a dressing in the British Critic and Theological Review. They see at last the mischief and scandal brought on them by Mosaic systems…. Probably there was a beginning—it is a metaphysical question, worthy of a theologian—probably there will be an end. Species, as you say, have begun and ended—but the analogy is faint and distant. Perhaps it is an analogy, but all I say is, there are, as Hutton said, ‘no signs of a beginning, no prospect of an end’…. All I ask is, that at any given period of the past, don’t stop inquiry when puzzled by refuge to a ‘beginning,’ which is all one with ‘another state of nature,’ as it appears to me. But there is no harm in your attacking me, provided you point out that it is the proof I deny, not the probability of a beginning…. I was afraid to point the moral, as much as you can do in the Q.R. about Moses. Perhaps I should have been tenderer about the Koran. Don’t meddle much with that, if at all. If we don’t irritate, which I fear that we may (though mere history), we shall carry all with us. If you don’t triumph over them, but compliment the liberality and candour of the present age, the bishops and enlightened saints will join us in despising both the ancient and modern physico-theologians. It is just the time to strike, so rejoice that, sinner as you are, the Q.R. is open to you. P.S. …I conceived the idea five or six years ago [1824-25], that if ever the Mosaic geology could be set down without giving offence, it would be in an historical sketch, and you must abstract mine, in order to have as little to say as possible yourself. Let them feel it, and point the moral (Lyell, 1881, I:268-271, bracketed words added). So we could add one more assumption to early 19th century science: the Bible has nothing relevant to say to the question of the age and history of the earth. But none of this is surprising when we consider the theological orientation of the men who were most influential in the development of the old-earth theory. Buffon was a deist or atheist, disguising the fact with occasional references to God (Gillispie, 1970-1980, vol. 2, pp. 577-578). Laplace was an open atheist (Brooke, 1991, pp. 238-240). Lamarck straddled the fence between deism and atheism (Brooke, 1991, p. 243). Werner was a deist (Page, 1969, p. 257) or possibly an atheist (Hallam, 1992, p. 23) and hence “felt no need to harmonize his theory with the Bible” (Gillispie, 1970-1980, vol. 14, pp. 259-260). Historians have concluded the same about Hutton (Dean, 1975, pp. 187-193). William Smith was a vague sort of theist, but according to his nephew (a fellow geologist) he was most definitely not a Christian.13 Cuvier was a nominal Lutheran, but recent research has shown that in practice he was an irreverent deist (Brooke, 1991, pp. 247-248). Lyell was probably a deist (or a Unitarian, which is essentially the same) [Russell, 1985, p. 136]. Many of the other leading geologists of the 1820s and 1830s were likewise anti-Christian. These men were hardly unbiased, objective pursuers of truth, as they would have wanted their contemporaries to believe and as modern evolutionists and historians of science want us to view them. …on this principle [of arranging the strata by their fossils] I have ventured, without much knowledge of Conchology, and with weak aids in that science (Smith, 1817, p. vi, bracketed words added). Charpentier (1825), one of the leading geologists in Europe, argued that only the relative position of strata could indicate the relative ages of the rocks, because knowledge of fossils and their distribution in the strata was not sufficiently precise to use them as an index for dating. Also, the conchologist William Wood decried the “extreme multiplication of the genera [of shell creatures], rather to increase than remove the difficulty of determining the species” (1825, p. iv, brackets added). In an article on mollusca in the Edinburgh Encyclopaedia (1830) the old-earth zoologist John Fleming remarked on persistent difficulties in classifying shell creatures into species, genera and even the correct orders. The next year, De la Beche (1831) expressed strong caution in using shells to date strata, because of the considerable errors and confusion in the catalogues of fossil shells. In the five editions of his Introduction to Geology published and revised between 1815 and 1838, the respected old-earth geologist, Robert Bakewell, repeatedly expressed his conviction that many of his fellow geologists relied too much on shells in their interpretations of the rocks: both in identifying distant, non-contiguous formations and in distinguishing fresh-water from marine deposits. He deemed this unwise because of the limited knowledge of shell creatures and the continuing evidence of much erroneous classification, especially the multiplication of species and genera.17 One reviewer of Bakewell’s 1828 third edition apparently agreed with him about the dangers in applying conchological knowledge to stratigraphy (T. anonymous reviewer, 1829). One of the most important challenges to the old-earth geologists’ use of mollusca to identify and correlate rock layers was the work of John Gray (1800-1875), a leading conchologist at the British Museum. In 1833 he recorded the many difficulties and errors that had been made in classifying shell creatures based on the shells’ features, which often resulted in the creation of many different species and genus names for what in reality was a single species. He cited examples where the shell nucleus (its embryonic form in the egg) of some large species had been mistaken for the full-grown shells of another species. He also noted that the nuclei of many shells of different genera do not have the same characters as their parent shells. He gave examples of shells that had swirls in opposite directions and so were classified as different species, when in fact they were the same. He showed that many species possess shells that are very regular when they are young, but whose adult forms are often irregular due to the substrate to which the animal attaches. Then there were the curious anomalies of shells that changed the direction of their last whorls as they approached maturity and sometimes even reverse the position of the mouth. And he noted that fractured shells had sometimes been named as different species. Gray remarked: “The shape of attached shells depends greatly on the form of the bodies to which they are applied; and this is a circumstance that has been generally overlooked by conchologists” (1833, p. 781). He noted that authors had multiplied species on this basis. Gray demonstrated that the water’s turbulence, the shell’s exposure to light, temperature, and food would profoundly affect the thickness, roughness, color or size of the shells, leading many conchologists to multiply species. 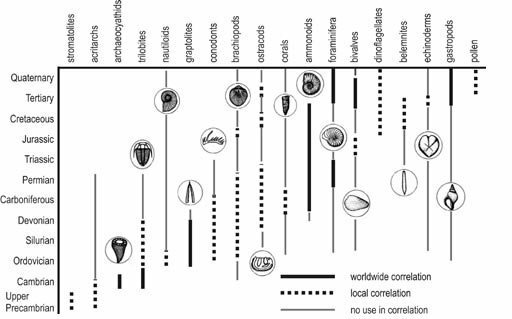 The article pointed out many other errors of conchologists (even leading experts) in the identification and classification of shell creatures at the species, genus, and family levels. So, the scriptural geologists were raising a serious objection against old-earth theories when they contested the use of shells to date the rocks and work out geological history. But shell creatures are still very important to the dating of rock layers and the defence of the evolutionary view of the geological record. The respected and detailed reference work Index Fossils of North America (Shimer and Shrock, 1944) lists all the index fossils used by geologists to identify and classify rocks in the 1940s. All the fossils found in that text are invertebrates, such as protozoa (single-celled creatures), porifera (sponges), coelenterates (corals, jellyfish, etc. ), echinoderms, annelids (e.g., worms), bryozoans, arthropods (trilobites, insects, etc.) and some plants (mostly of microscopic size). The largest two groups of index fossils are the brachiopods (bivalve shells) and mollusks (various kinds of other shell creatures such as snails, nautiloids, etc). Fish, amphibians, reptiles, mammals and birds are not listed. In a short layman’s book on the age of the earth published by the Institute of Geological Sciences in London (Thackray, 1980), we find a chart (p. 10) of the key index fossils and they are largely shell creatures (Figure 4). 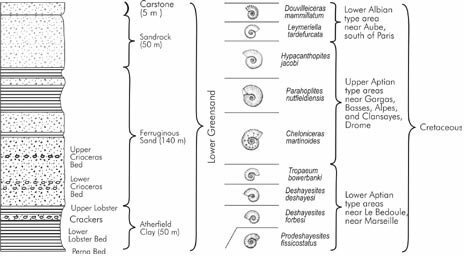 In commenting on the chart (p. 8), Thackray informs readers that graptolites and ammonites are the most useful index fossils and he illustrates with a chart on page 13 (Figure 5). Here the strata are classified and correlated by ammonites which supposedly represent about 15 million years of depositional history. Note that all the pictured ammonites which have been given different species names and in most cases even different genus names. One can only wonder if these classifications would remain valid under the critical eye of Gray back in 1835. Thackray’s (1980) representation of the use of index fossils. Thackray’s (1980) representation of 15 million years of ammonite evolution. But there continues to be problems with classification of shell creatures. Ammonites are important index fossils, found in a wide range of sizes and in abundance from the Devonian to the Upper Cretaceous. Milton (1992) discussed their stratigraphic use in an Early Jurassic formation exposed in a pit in the village of Blockley, near Gloucester, England. Two ammonites dominate this formation: Liparoceras (fat, with two rows of knobs on the side) and Aegoceras (thin, with no knobs). A rare third form is said by evolutionists to be an intermediate between the first two, and has been labelled Androgynoceras, which resembles Aegoceras when it is young but looks like Liparoceras when it is old. The complexity of the modern classification, seen in the systematic parts of this Treatise, results mainly from acceptance in large measure of the theory of iterative evolution, although there are relatively few proved examples of its occurrence. We often feel sure that it has occurred and that we should be deceived if we accepted similarities at their face value (Haas, 1942 has brought together a few outstanding examples) but we can seldom demonstrate just what the ‘iterative’ relationships are. Waagen (1869) in a pioneer work attempted to demonstrate lineages, or lines of descent…. The chief obstacle to such studies is that a lineage is an oversimplified concept; it is impossible to pick out a stratified succession of individuals which can with certainty be said to be genetically connected in the strict ancestor-descendant relationship (italics added). Recent research by a Japanese team studying the 20 species of Euhadra snails has shown that changes in a single gene can change the direction of the shell spiral, thereby inhibiting, if not prohibiting, two snails with different shell directions to mate (Milius, 2003). The great evolutionary neo-catastrophist of the late 20th century, Derek Ager (1993, p. 142), discussed at one point 10 quite different species of shell creatures and showed the significant changes in shell appearance of each species resulting from abrupt climate-induced changes in lake levels in sub-Saharan Africa. However, all his charts in the book showing the time-correlation of strata use only shell creatures (Ager, 1993, pp. 132, 133, 135, 141, 142, 148). Levinton figure supposedly showing the evolution of chesapecten shells over 10 million years. Paleontologists must name species based upon morphology, or shape. It is assumed that similar shape is a reflection of genetic relatedness as well. However, when one is designating a species, she must realize that there is inherent variation within species. Just as no two humans are exactly alike, no two clams are the same. This variation can be produced by simple genetic variation or environmental conditions. For example, some snails that live on rocky coasts may have thicker less ornamented shells than members of their own species that live in quieter water (Huntley, no date). Levinton’s article does not even have accurate drawings of the shells (Figure 7). Just as Gray argued in 1835, geologists and paleontologists seem to still make too much of the variations seen in shell creatures. Photograph of Chesapecten jeffersonius. From Wikipedia. Contrast the front and back views of this shell with Levinton’s second drawing from the top in Figure 6. Alroy has also used the database to reassess the accuracy of species names. His findings suggest that irregularities in classification inflate the overall number of species in the fossil record by between 32 and 44 percent. Single species often end up with several names, he says, due to misidentification and poor communication between taxonomists in different countries. All of this gives us further reason to be suspicious of the validity of the geological column as a representation of the worldwide geological record that has been erected primarily on the basis of shell creatures. One more very important principle needs to be considered in the development of the geological column. That is the principle of judging the non-existence of a creature in history based on the absence of its fossil remains. Consider this discussion of index fossils in a standard geology textbook. No matter where on earth they are found individual species always occur in the same sequence relative to one another. By comparing fossils found in a layer of rock in one area with similar fossils in another area, we can correlate the two rock unites. More accurately, we can say that both rock units formed during the span of time that the species existed on the earth. Ideally, a geologist hopes to find an index fossil, a fossil from a very short-lived species known to exist during a specific period of geologic time. A single index fossil allows the geologist to correlate the rock in which it is found with all other rock layers in the world containing that fossil (Plummer and McGeary, 1993, p. 167, emphasis in the original). This reasoning about index fossils is clearly based on the assumption that the absence of fossils in a certain layer of rock means that the creature did not exist at the time in which that layer was deposited. William Smith provided geologists with a key by which the doors of past time might be unlocked: the principle of faunal succession led others to use specific fossils aggregates to delineate units in a time scale. If instead of classifying the strata by mineral or chemical analogies, we resolve to employ the characters furnished by successive combinations of organic life which have appeared and vanished on the land and sea, we shall obtain an arrangement of remarkable simplicity, more precise in application, and yet less disagreeably harsh in definition, than that which has been so long followed. We shall have three great systems of organic life, characterizable and recognizable by the prevalence of particular species, genera, families, and even orders and classes of animals and plants, but yet exhibiting, clearly and unequivocally, those transitions from one system of life to another, which ought to occur in every natural sequence of affinities, dependent on and coincident with a continuous succession of physical changes, which affected the atmosphere, the land and the sea (quoted in Berry, 1968, p. 118, italics in original). Based on the presence or absence of fossils Phillips was assuming that different kinds of creatures lived in different systems of life at different times. Of course, if the Flood occurred, as the Bible teaches, and it produced most of the geological record of sedimentary, fossiliferous rocks, then this old-earth thinking is very erroneous. The absence of fossils is no indication at all of the non-existence of a particular kind of creature. The fossil record of the earliest plants is very poor. Fossils of mosses generally considered the most primitive of the living land plants, have been found from the Devonian period, but surely they existed earlier but did not fossilize… The first vascular plants were found in the Silurian. The dominant plants in the Paleozoic era (particularly the Carboniferous) were lycopods, ferns, and seed ferns. The Mesozoic was dominated by gymnosperms, … while the now dominant plants, the angiosperms, did not flourish until the Cretaceous … even though they originated in the Triassic. The entire enormous radiation of the flowering plants occurred since the middle of the Cretaceous, coevolving with a similar radiation of insects. Mayr assumes the mosses existed earlier than we find them fossilized, because the evolution theory demands it. But he undoubtedly would have cried “foul” if creationists assumed that all plants and insects he mentions actually existed before their first appearance in the fossil record. So-called “living fossils” are strong evidence of the fallacy of this assumption that absence of the fossils in a particular layer of rock means that the creature did not live at the same time as the fossilized creatures in that layer. Many examples can be given of creatures that evolutionists claimed for decades had long been extinct until living specimens were discovered which looked virtually identical to the fossil specimens. The Wollemi Pine was claimed by evolutionists to have gone extinct about 150 million years ago, because it was not found fossilized in rock layers assumed to be younger than that. Then it was discovered alive in 1994 and when it was compared to the fossil specimens it was seen to be virtually identical (Catchpoole, 2000a). The same could be said of the coelacanth fish and “Gladiator” insects (Catchpoole, 2000b). Similarly, and related to our previous discussion on shells, slit shells (Family Pleurotomariidae, so called because of the slit part of the way around the shell between the last and penultimate spirals of the top-like shell) are called by evolutionists “the most primitive gastropods” (Hill, 2004, p. 8) because they are found in Upper Cambrian rocks (dated at 500 Ma). These deep-water shells were thought to be long extinct until they were discovered alive in 1855 (by Western scientists who didn’t know that the Japanese had discovered them in 1772) and observed to be essentially identical to the oldest fossils (Hill, 1996). Surely no one believes that these “living fossil” creatures actually went extinct for millions of years and then evolved back into existence to look just like their ancestors. Rather, they have been continuously alive since the first specimens were fossilized even though there was no fossil evidence of their existence in later deposited rock layers. Thus, this fundamental assumption of old-earth geology is wrong. The absence of fossils in a particular rock layer does not mean that those creatures did not exist at the time of deposition of that layer. It only means that the creature was not buried in that layer or that it was but we haven’t found it yet. Absence of fossil remains does not demand its nonexistence. This erroneous thinking was especially applied to the antiquity of man relative to the Earth. A significant reason that the vast majority of geologists in the early 19th century believed that most of the geological record was deposited long before the creation of man was their conviction that no fossil human bones had been found except in recently formed deposits, and never with extinct animals.19 Buckland (1836, p. I:103) said that “no conclusion is more fully established, than the important fact of the total absence of any vestiges of the human species throughout the entire series of geological formations.” Clearly, even if that were true, it would not mean that man did not exist when the fossilized creatures did. The absence of evidence is not evidence of absence. But many scriptural geologists argued that several fossilized human bones had been found in older rocks, and that this refuted the generally accepted opinion thereby militating against the old-earth theory.20 They reasoned that if fossilized man was found in the same rock layer with any extinct creature, this fact would falsify the assumption that any other extinct creatures not found buried with man were necessarily in existence and became extinct before the creation of man.21 At the time, these arguments by the scriptural geologists were ignored or dismissed by old-earth proponents on the contention that the cited fossil evidence had been misinterpreted either by the men who discovered the fossils or by the scriptural geologists who read their published reports. However, not many years later Lyell (1863) and Phillips (1855) argued that several findings (cited by scriptural geologists) had indeed demonstrated that man had lived, died and was buried at the same time as some extinct animals. However, rather than argue that the rocks were deposited only a few thousands of years ago, Lyell and Phillips used the evidence to prove the great antiquity of man (beyond the biblical chronology)—even though the scriptural geologists had earlier used the same evidence to argue against the antiquity of the Earth. Lyell was not able to examine all of the physical evidence (which had been reported three decades earlier) because some of the sites had been destroyed by quarrying. But what he did see convinced him that the original investigators had provided “ample evidence” for their conclusions. He explained that the reason geologists back then (including himself) had not been willing to believe those conclusions was that the discoveries “contradict[ed] the general tenor of previous investigations” (p. 68, brackets added). The scriptural geologists, however, had contended that the reason for unbelief was that the findings contradicted the old-earth theories. In addition, several scriptural geologists contended that the argument for the non-existence of man (or indeed any other creatures) in earlier times, based on the absence of fossil evidence, was philosophically unsound. They argued that since all contemporary creatures do not live in the same ecological habitat, it is unreasonable to expect them to be buried together. Also, geologists had only examined a very small portion of the Earth’s strata. Furthermore, if during the Flood much of the antediluvian continents had been submerged to become post-diluvian ocean bottoms, most humans would have been buried out of the reach of geological investigation. The deeper we descend into the strata of the Earth, the higher do we ascend into the archaeological history of past ages of creation. We find successive stages marked by varying forms of animal and vegetable life, and these generally differ more and more widely from existing species, as we go further downwards into the receptacles of the wreck of more ancient creations. When we discover a constant and regular assemblage of organic Remains, commencing with one series of strata, and ending with another, which contains a different assemblage, we have herein the surest grounds whereon to establish those divisions which are called geological formations, and we find many such Divisions succeeding one another, when we investigate the mineral deposits on the surface of the Earth. Lyell’s observation seems to be confirmed on a regular basis in our own time. For example, recently paleontologists digging in China and Mongolia have unearthed thousands of well preserved salamanders in rocks supposedly 165 million years old, although previously the earliest they had been found was in rocks estimated to be 65 million years. These new fossils resemble salamanders found today in North America and Asia (Gao and Shubin, 2003). Many other “living fossils” virtually indistinguishable from their supposedly ancient ancestors could be cited. Many of the pioneers in the development of the science of geology worked within a biblical framework. They saw in the geological record a testimony to the truth of Genesis regarding Creation and the Flood. But in the late 18th and early 19th centuries, several false assumptions began to control geological thought. Uniformitarian methodological naturalism divorced geology from the Bible and excluded God’s mighty acts of creation and judgment from history. This rejection of Scripture’s testimony to geologically significant events in history was conscious and intentional, and driven by anti-biblical worldviews (e.g., deism and atheism). In spite of their great ignorance of living and fossil creatures and the fossil record as a whole, leading geologists based stratal successions on questionable variations in shell creatures. They also assumed that the absence of fossil remains in particular strata was unambiguous evidence for their historical absence worldwide. Errors in logic and empirical errors were both built into their history of the Earth. Unfortunately, the old-earth proponents at that time never really engaged the arguments of their well-informed critics (scriptural geologists). That continues today—old-earth proponents commonly ignore young-earth creationists and their arguments. The correct interpretation of the geologic record can only be obtained by using biblical assumptions gleaned especially from the history of Genesis 1-11. Young-earth creationists must help each other to see when they are unconsciously reasoning with the anti-biblical assumptions developed by the scientific establishment over the past 200 years. Otherwise, the rocks will continue to be a confusing mystery. Dr. Terry Mortenson has degrees in math (BA), theology (MDiv), and history of geology (PhD). After serving for 26 years with Campus Crusade for Christ, primarily in Eastern Europe, he became a speaker, writer and researcher with Answers in Genesis in 2001. He and his wife, Margie, have eight children. Abbott, C. and P. Dance. 1998. Compendium of Seashells. Odyssey Publishers, El Cajon, CA. Ager, D. 1973. The Nature of the Stratigraphical Record. MacMillan Press, London. ___. 1993. The New Catastrophism. Cambridge University Press, Cambridge, UK. Bakewell, R. 1815. An Introduction to Geology. Second edition. J. Hardy, London. ___. 1828. Third edition, Longman & Co, London. ___. 1833. Fourth edition, Longman & Co, London. ___. 1838. Fifth edition, Longman & Co, London. Berry, W.B.N. 1968. Growth of a Prehistoric Time Scale. W.H. Freeman, San Francisco, CA. Beudant, F.S. 1816. Extract from a memoir read to the Institute on the 13th of May 1816 on the possibility of making the Molluscae of fresh water live in salt water, and vice versa. Philosophical Magazine XLVIII(22):223-227. Brooke, J.H. 1979. The natural theology of the geologists: some theological strata. In Jordanova, L.J. and R.S. Porter (editors). Images of the Earth. British Society for the History of Science, Monograph 1. ___. 1991. Science and Religion. Cambridge University Press, Cambridge. Buckland, W. 1820. Vindiciae Geologicae, University Press, Oxford. Catchpoole, D. 2000a. Another ‘living fossil’ tree. http://www.answersingenesis.org/docs2/4416livingfossil_tree12-25-2000.asp. ___. 2000b. ‘Living fossils’ enigma. Creation Ex Nihilo 22(2):56. http://www.answersingenesis.org/creation/v22/i2/living_fossil.asp. de Charpentier, J. 1825. On fossil organic remains as a means of distinguishing rock-formations. Edinburgh Philosophical Journal XII(24):320-321. Coleman, W. 1973. Cuvier and Evolution. In Russell, C.A. (editor). Science and Religious Belief. Hodder and Stoughton, Sevenoaks, Kent, UK, pp. 229-234. Reprinted from Coleman, W. 1964. Georges Cuvier, Zoologist. pp. 172-175. Harvard University Press, Cambridge, MA. Conybeare, W. and W. Phillips. 1822. Outlines of the geology of England and Wales, Williams Phillips, London. Cuvier, G. 1813. Essay on the Theory of the Earth. Robert Kerr, transl. William Blackwood, Edinburgh. ___. 1834. Researches on Fossil Bones. 4 volumes. No publisher given, London. Buffon, G. Oeuvres Philosophiques, p. 56A, quoted in Gillispie, C.C. (editor). 1970-1980. Buffon, Georges-Louis Leclerc, Comte de. Dictionary of Scientific Biography. vol. 2:578. Scribner, New York. “Buffon, Georges-Louis LeClerc, Comte de,” Dictionary of Scientific Biography (New York: Scribner, 1970-80, 16 vol. ), Charles C. Gillispie, ed., vol. 2. pp. 576–581. “Cuvier, Georges,” DSB, vol. 3, pp. 521-528. De la Beche, H. 1831. A Geological Manual. Treuttel and Würtz, London. Dean, D.R. 1975. James Hutton on religion and geology: the unpublished preface to his Theory of the Earth (1788). Annals of Science 32:187–193. Fleming, J. 1830. Mollusca. Edinburgh Encyclopaedia XIV. Gao, K. and N.H. Shubin. 2003. Earliest known crown-group salamanders. Nature 422:424-428. Gillispie, C.C. 1951. Genesis and Geology. Harper and Brothers, New York. Gould, S.J. 1987. Time’s Arrow, Time’s Cycle. Harvard University Press, Harvard. Gray, J.E. 1833. Some observations on the economy of molluscous animals, and on the structure of their shells. Philosophical Transactions. CXXIII, Part 2:771-819. ___. 1835. Remarks on the difficulty of distinguishing certain genera of testaceous mollusca by their shells alone, and on the anomalies in regard to habitation observed in certain species. Philosophical Transactions. Part 2:301-310. [Note: A one-page summary of this appeared under the same title in Philosophical Magazine, 3rd Serial, volume VII(39):210]. Greenough, G. 1819. A Critical Examination of the First Principles of Geology. No publisher given, London. Hahn, R. 1986. Laplace and the Mechanistic Universe. In Lindberg, D.C. and R.L. Numbers (editors) God and Nature. University of California Press, Berkeley. Hallam, A. 1992. Great Geological Controversies. Reprint of 1989 second edition (first ed. in 1983). Oxford University Press, Oxford. Hill, L. 2004. The World’s Most Beautiful Seashells. World Publications, Tampa, FL. [see also Tabor, B.K. 1996. Vistas. Smithsonian Institute Report No. 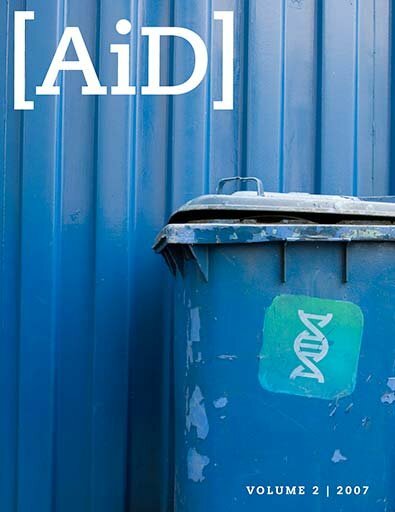 83, http://www.si.edu/opa/insideresearch/9683/9683vist.htm]. Holmes, A. 1965. Principles of Physical Geology. Second edition. Ronald Press, New York. Huntley, J. Chesapecten Evolution. NSF GK-12 Graduate Fellows Program, University of North Carolina at Wilmington, no date but sources referenced in this article indicate that it was posted in or after 2002, accessed 25 January 2006). Laudan, R. 1987. From Mineralogy to Geology: the Foundations of a Science. University of Chicago Press, Chicago. Levinton, J.S. 1992. The big bang of animal evolution. Scientific American (Nov.). Lyell, C. 1830-1833. Principles of Geology. John Murray, London. ___. 4 May 1832. Lecture II at King’s College London on 4 May 1832. Quoted in Rudwick, M.J.S. 1976. Charles Lyell Speaks in the Lecture Theatre. The British Journal for the History of Science IX(32):150. ___. 1855. Manual of Elementary Geology. no publisher given, London. ___. 1863. The Antiquity of Man. no publisher given, London. ___. 1881. Full letter. In Lyell, K. (Lyell’s sister-in-law). Life, Letters and Journals of Sir Charles Lyell, Bart. I:268-271. John Murray, London. Lyell, K.M. (editor) 1881. Life, Letters, and Journals of Sir Charles Lyell, Bart. John Murray, London. Macculloch, J. 1824. Hints on the possibility of changing the residence of certain fishes from salt water to fresh. Quarterly Journal of Science XVII(34):209-231 (especially 230-231). ___. 1830. Organic Remains. In Brewster, D. (editor) Edinburgh Encyclopaedia XV:753-754. ___. 1831. A System of Geology. 2 vol. No publisher given, London. Mantell, G. 1839. Wonders of Geology. Second edition. 2 vol. No publisher given, London. Mayr, E. 2001. What Evolution Is. Basic Books, New York. Milius, S. 2003. Your spiral or mine? Science News 164(16):243-244. Milton, R. 1992. The Facts of Life: Shattering the Myth of Darwinism. Fourth Estate, London. Morris, H.M. 1993. History of Modern Creationism. Institute for Creation Research, Santee, CA. Mortenson, T. 2004. The Great Turning Point. Master Books, Green Forest, AR. O’Connor, J.J. and E.F. Robertson. 2004. Georges Louis Leclerc Comte de Buffon, http://www-history.mcs.st-andrews.ac.uk/Mathematicians/Buffon.html, accessed Jan 2006. Page, L.E. 1969. Diluvialism and its critics in Great Britain in the early nineteenth century. In Schneer, C.J. (editor). Toward a History of Geology. M.I.T. Press, Cambridge, MA. Phillips, J. 1829-1836. Illustrations of the Geology of Yorkshire. 2 vol. No publisher given, York, England. Phillips, J. 1837-39. Treatise on Geology. 2 vol. Cabinet Cyclopaedia, London. ___. 1844. Memoirs of William Smith. John Murray, London. ___. 1855. Manual of Geology. Quoted in Anonymous. 1857. Voices from the Rocks, pp. 83-85. No publisher given, London. Plummer, C.C. and D. McGeary. 1993. Physical Geology. Sixth edition. William C. Brown, Dubuque, IA. Porter, R.S. 1976. Charles Lyell and the Principles of the History of Geology. The British Journal for the History of Science IX(32):91. Robb, L.J., A.H. Knoll, K.A. Plumb, G.A. Shields, H. Strauss, and J. Veizer. 2004. The Precambrian: the Archean and Proterozoic eons. In Gradstein, F.M., J.G. Ogg, and A.G. Smith (editors). A Geologic Time Scale 2004. Cambridge University Press, Cambridge, UK. Rudwick, M.J.S. 1985. The Meaning of Fossils: Episodes in the History of Palaeontology. Second edition. University of Chicago Press, Chicago. Rupke, N.A. 1983. The Great Chain of History. Clarendon Press, Oxford. Russell, C.A. 1985. Cross-currents: Interactions between Science and Faith. IVPress, Leicester. Sedgwick, A. 1831. Address to the Geological Society. Philosophical Magazine N.S. IX(52):314-315. Sheppard, T. 1914-1922. Proceedings of the Yorkshire Geological and Polytechnic Society N.S. XIX(1914-1922): opposite page 137. Shimer, H.W. and R.R. Shrock. 1944. Index Fossils of North America. John Wiley, New York. Smith, J. 1838. On the last changes in the relative levels of the land and sea in the British Islands. Memoirs of the Wernerian Natural History Society. III:84-85. Smith, W. 1815. A Memoir to the Map and Delineation of the Strata of England and Wales, with part of Scotland. No publisher given, London. ___. 1816. Strata Identified by Organized Fossils. W. Arding, London. ___. 1817. Stratigraphical System of Organized Fossils. E. Williams, London. ___. 1835. Deductions from Established Facts in Geology. No publisher given, Scarborough, England. Sohn, E. 2003. The fossils files. New Scientist 179(2409):33. T. 1829. Anonymous review of Robert Bakewell’s An Introduction to Geology, third edition. In Magazine of Natural History 1(4):355-356. Taylor, R.C. 1829. Geological Arrangement of British Fossil Shells. Magazine of Natural History II(6):26-41. Thackray, J. 1980. The Age of the Earth. Institute of Geological Science, London. “Werner, Abraham,” Dictionary of Scientific Biography, vol. 14, pp. 259-60. Whewell, W. 1832. Anonymous review of Lyell’s Principles of Geology. Quarterly Review XLVII(93):126. Winter, J.G. (translator). 1916. Nicholaus Steno (1638–1686): The Prodromus of Nicholaus Steno’s dissertation concerning a solid body enclosed by process of nature within a solid. Reprinted in White, G.W. 1968. Contributions to the History of Geology, volume 4. Hafner Publishing, New York. Wood, W. 1825. Index Testaceologicus; or a Catalogue of Shells, British and Foreign. No publisher given, London. Young, D. 1988. Christianity and the Age of the Earth. Artisan Publishers, Thousand Oaks, CA. Previous Article Jesus, Evangelical Scholars, and the Age of the Earth Next Article Did God Create (Bara) or Make (Asah) in Genesis 1? Much of the information in this chapter has been taken from various portions of Terry Mortenson’s, The Great Turning Point (Green Forest, AR: Master Books, 2004) and is used here with the kind permission of the publisher. This was intended to serve as an introduction to a longer work on geology, which never was written. See the English translation and introduction by J.G. Winter in White (1968). He accepted Archbishop James Ussher’s 4004 BC date of creation. For further discussion of these 17th and 18th century writers on geology, see Rudwick (1985, pp. 1–93) and Young (1988, pp. 27–42). For further discussion of these three writers, see Brooke (1991, pp. 234–242) and Hahn (1986, pp. 256–276). Neptunism was named after the Roman god of the sea whereas Vulcanism takes its name from the Roman god of fire. This was not a completely new idea; Aristotle expressed similar views in his On Meteorology. See Rudwick (1985, pp. 37–38). William Smith (1815; 1816; 1817). See Phillips (1844, pp. 25–26) and Smith (1835). The latter work (a large one-page explanatory diagram) was Smith’s last and clearest statement on his view of Earth history and was obviously intended to be a response to Lyell’s uniformitarianism. Though, when he referred to the “Deluge” he possibly meant the Noachian Flood, he made no reference to Scripture. However, he was quite emphatic about the supernatural nature of the many revolutions and creations after these catastrophes. The terms “catastrophism” and “uniformitarianism” were coined by the historian and philosopher of science William Whewell (1832, p. 126) in an anonymous review of Lyell’s Principles of Geology. It was the editor and publisher of Cuvier’s English editions, Robert Jameson, who made the clear connection between Cuvier’s last catastrophe and Noah’s Flood, no doubt to make it more compatible with British thinking at the time. The Oxford geologist William Buckland made this idea even more popular. See Rudwick (1985, pp. 133–135). Holmes does not cite his source. The second half of his quote is found in Hutton’s Theory of the Earth (Edinburgh: William Creech, 1795), vol. 2, p. 547. I could not find the first half of the quote in vol. 1 or 2 or in Hutton’s 1788 journal article with the same title. Smith’s own writings reveal this vague theism, as do comments by geologist John Phillips, Smith’s nephew and geology student. See Phillips (1844, p. 25). It is safe to say that Smith was definitely not a committed Christian. Smith (1816; 1817, p. vi and “Geological Table” after page xi). This table is reproduced in Sheppard (1914–22, opposite page 137). Other old-Earth geologists said the same: Taylor (1829, pp. 26–41); Phillips (1837, pp. I:77–78); and Mantell (1839, p. I:202). This criticism of Cuvier was inaccurate, because, as noted above, Cuvier himself cited reasons why shells were not reliable indices and so why he built his theory of the Earth totally on the basis of quadruped fossils. Bakewell (1828, third edition, pp. 44–45) in this edition quotes from his 1815 second edition without giving the page numbers therein. See also 1833 (fourth edition, pp. iv–v, 42–43, 565) and 1838 (fifth edition, pp. 46–47, 397–404, 635). It is noteworthy that both Mantell (1839, second edition, p. I:202) and Phillips (1837, p. I:78) cited Gray’s 1833 article, but not his 1835 article. William Buckland referred to neither article in the various discussions of shells in his Bridgewater Treatise (1836). c.f., Conybeare and Phillips (1822, p. lix); Lyell (1830–1833, pp. I:153–54). These included Fairholme, Murray, Young, Penn and Bugg. See Mortenson (2004). In other words, just because the dodo bird is now extinct (becoming so in the 18th century) does not mean that dodo birds became extinct before man was created. Lyell, of course, had his own agenda in saying this. At the time he was still very much opposed to the idea of progression (or evolution) in terms of plant and animal history, favoring instead a cyclical uniformity to life. See Gould (1987, pp. 132–142) and Ager (1993, p. xvii).